The leash, not just for walks anymore! As an aid to potty training. An important part of potty training is teaching your puppy where to go. To help with this, take him to a designated potty spot on leash. Having the dog on leash will help keep him focused on the task at hand. The leash prevents the dog from getting distracted and wandering off, which can cause him to forget why he was taken out in the first place. To prevent your dog from practicing unwanted behaviors. 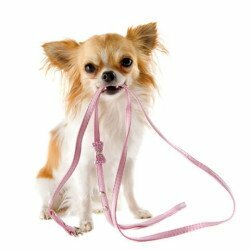 When your dog is on a leash in the house you can prevent him from jumping on guests, stealing things and running away, and chewing on inappropriate things. You’ll be right there to guide him to the correct behaviors before ha has a chance to do the incorrect thing. To teach your dog to settle down when asked to. With your dog on leash, and tied to a sturdy object, you can provide a comfy bed, or mat, and a chew toy and teach your dog that life’s not always about them! Dogs, like children, need to learn to entertain themselves at times. Tethering you dog near you while you’re working or relaxing can help your dog learn this important skill. SAFETY NOTE: Do not leave your dog tied to any object if you aren’t there to supervise him, don’t let him wander unsupervised with his leash dragging behind him, and don’t tie him to an object that can fall over on top of him if he tries to pull away.